I get a lot of questions about Ninja Blenders. This is not surprising, since the main search terms people use to find Test Kitchen Tuesday have some variant of “Ninja Blender” in them! I thought it might be worthwhile to do a big roundup that contains the most common questions I get to save current (and future) readers time from scanning the hundreds—and even thousands—of comments on this topic. If you have a question I don’t address below, please leave it in the comments so we can get it answered. Odds are if you have the question, so does someone else. So, without further adieu, let’s get to it, shall we? Can any of the Ninja Blenders make hot soup? Nope, unlike a Vitamix, the Ninja does not heat up the ingredients as it blends. You can definitely blend hot soup in it, but, you can’t start with cold ingredients and end up with soup. Are the single serve cups from one model compatible with another model? Unfortunately, no. The single serve cups are specific to the model they come with. For example, you can’t take a single serve cup from a Ninja Pulse and use it in the Ninja Mega. And, if your unit wasn’t designed for single serve cups, you can’t buy the single serve cups and have them work. This is a total bummer. Do I need the mini prep bowl for the Ninja Mega Kitchen System? This is totally personal preference and where you plan to buy the NMKS. The mini prep bowl comes with the model sold at Bed, Bath & Beyond, Amazon, and, sometimes, Target. If you buy directly from Ninja, you likely won’t get the mini prep bowl (unless you pay extra). If you make lots of food processor recipes in small batches (like baby food), you will find it valuable. As with all Ninja Blenders, the Ninja Mega works best with volume – so, if you’re just making something small, you may have a hard time blending in in the 64 ounce food processor bowl. However, if you don’t care too much about small batches, you probably won’t miss it. Can you use X/Y/Z part from one Ninja model on another? In general, the answer here is no. The parts are unique to their specific models. I think this I a huge fail on the part of Euro Pro, but, then again, this is just my opinion. What are the Ninja Blender jars made of? They are made of BPA-free plastic and are dishwasher safe. Be sure to put the lids on the top rack, or they could melt (I speak from experience). How do the plastic jars hold up? For the most part, the plastic jars are very durable and hold up well in the dishwasher. You have to be careful removing the blade, though, as that is where the potential to create scratches in the jar occurs. Pull the blade straight up to remove – that way the sharp blade doesn’t come into contact with the plastic of the jar. How do the Ninja Blenders (any model) compare to a traditional blender/Magic Bullet/Nutrilbullet/fill-in-the-blank type blender? One of these days, I may do a huge showdown between the gamut of blenders on the market. But right now, I can tell you there are pros and cons to all types of blenders. The Ninja Blender family will blend the stuffing out of just about anything you can think of, and they will do it quickly. The unique blade design running up the center means you get quick mixing of very hard ingredients without any “jamming.” However, this blade design can also be a detractor, as it can be hard to get green smoothies totally smooth without any green bits (it is possible, you just have to add ice and blend a little longer than you might expect). The power on the machines is more than ample, and once you go to this kind of power, it is hard to go back. I had to blend some things in a traditional blender at a rental house recently, and it was highly frustrating! It’s sort of like driving a Porsche for a while and then driving an electric car! Have you tried any of the recipes from the Ninja folks? No, I honestly haven’t! I have read through the recipe booklet that comes with the Ninja Mega KS, but I eat a little differently than the mainstream audience that Ninja must target. Therefore, none of their recipes are terribly appealing to me. I just make mine up as I go, and then share them with you! Can you make bean/nut/rice/wheat flour with the Ninja blenders? Absolutely, yes! Can the Ninja blenders make juice? Ah, this is a highly debated topic. The answer is yes, you can make juice with any of the Ninja blenders. But, how you do it can vary. If you like pulp, you can add 5-6 ice cubes to your fruits and veggies before blending and get “whole food juice.” If you don’t like pulp, you’ll need to add water before blending and then strain before drinking. Some people don’t mind this step, some people do. If you are going to juice a lot (daily), I would probably recommend buying a dedicated juicer. Can the Ninja Pulse do what the more powerful Ninjas can? For the most part, yes. I have used my Ninja Pulse to make all my smoothies, nut butters, and a plethora of blending projects. It’s main differences are the smaller size of the jar, blade design (4 blades instead of 6), and the fact that you can only “steady state” blend on one speed, which I would say is comparable to level “1” on Ninja Professional blenders. It is way more powerful than most traditional blenders, and the smaller size is nice for a small apartment or dorm room. I can’t get my blender to start! There is a blinking red light, but it won’t blend – what’s wrong? For Ninja Professional Blenders, the odds are you have the lid on slightly wrong. There are two arrows you need to line up: one on the lid itself, and on the handle. The blender won’t blend until the lid is on with those to arrows aligned. Are any parts of the Ninja Blenders microwave safe? No, there are no microwave-safe parts. You can blend hot foods in any of the containers, just don’t microwave. And those, friends, are the most common questions I get. Have I overlooked yours? Let me know in the comments! Is there a way to cover up the hole on the lid for the 16 oz. Single Serve cups. I spilled my kale/mixed berry smoothie all over my car this morning? Great website by the way. I get lots of recipes from here. Oh no! That is definitely unpleasant. The single serve lid is definitely a weak link, both the old style with the sort of closeable lids which leak even when closed, and the new style with the permanently open lid. I have been wracking my brain this morning to think of a MacGyver-type solution for you. The best I can think of is perhaps using some sort of tape to cover the hole while you are in transit. Sorry I don’t have something better – agree it is not ideal! I just saw that the new Ultimate has flip top sealable lids for their single cups. I own the Mega 1500 so I called Ninja to see if the new lids can be purchased separately and would they fit the cups I own now. The answer was yes on both…The price was $4.95 a lid plus shipping. I asked the rep if I could 2 for 1, and he said yes…so I did get 2 new lids for $4.95, but the shipping went up slightly. Paul, this is great info – thank you so much for sharing what you found out!! Hi! I’ve been searching for lids that can close for my Ninja! Will the ones you described work for the single serve cups that come with the Ninja Professional? Thanks! Are the single serve cups that go with ninja pulse microwaves? No, the single serve cups are not microwave-save (nor are any parts for the Ninja blenders). They can blend hot liquids, but just don’t put them in the microwave! Aside from any differences in add-on containers, how much difference in power and what can be made between the 1100 and the 1500? I can’t decide which to buy. There is 400 watts of power difference between the two. Is it enough to notice? Maybe, but probably not. 1100 watts is ample, I think, if you don’t want the extra containers and whatnot. 1. I saw whe you gave the how to’s for apple juice, you weren’t using the mega 1500 in the pics since It probably wasn’t around at that time. have you tried it agin with the 1500? just wondering I the higher watts and horsepower cut down on the pulp at all like they say in the informercial. 2. I looked, but did not see (I could be blind LOL) a recipe for the Ninja Peach Ice cream…simole one, not having to use a stove to make a creme en glaise. 1) You’re right! The Mega didn’t exist when I did the apple juice how-to. I haven’t re-created it, but I have made other juices like carrot/apple, green juices, and beet/apple, and I can tell you, there is still pulp, no matter what they say in the infomercial. If you want to make “whole food” juice, you can add a 5-6 ice cubes and the Mega definitely pulverizes it out better than other Ninjas due to the higher HP. If you’re going for traditional apple juice though, it’ll still need to be strained. 2) I have never created a Ninja Peach ice cream, but that sounds good! I’ll pick up some frozen peaches (we don’t have fresh in the NW yet) next time I’m at the store and give it a shot. However, off the cuff, you could probably blend frozen peaches, heavy cream (or coconut milk), sugar to taste, a bit of vanilla and a dash of salt and get a decent soft serve. Angela, my sister in law showed us her VitaMix and whipped us up some incredible smoothies. We are hesitant to invest this kind of $ into a kitchen appliance, but reviewers all over the web keep saying that it is in a class of its own, especially when it comes to green smoothies. Ability to heat, for me, is inessential. The green smoothie ability is more important, and I like that I can add flax or other beneficial grains into the kids’ smoothies. I have a little coffee grinder I use for flax/grains. It’s an extra step, but not one that makes me want to spend the extra $300-$400. That being said, I attempted to make one of your green smoothie recipes with our Cuisinart (our existing blender didn’t hold enough to tackle the volume), and I ended up with what I later called “bunny vomit”, and poured it out into my azaleas. (it was the Cuisinart, not the recipe, I assure you: I would have gladly eaten any of those veggies solid!) I see how big of a difference the ability to liquefy green is, and with three picky children to feed, should I save up for VitaMix or will the Ninja 1100 handle it? How much extra blending time and ice, and will the greens ever be non-pulpy? Thank you! This is a popular question, no doubt, and I am in your camp – the Vitamix is so expensive. Here is a post I did that compares the two blenders making a green smoothie real time. The Vitamix makes a smoother green drink faster, BUT, I have made smooth green drinks in the Ninja as well, you just need to blend longer. You only need 5-6 ice cubes, and blend maybe 90 second or so. If you can swing the budget, I would push you towards the Ninja Mega KS for two reasons. 1) The single serve cups. 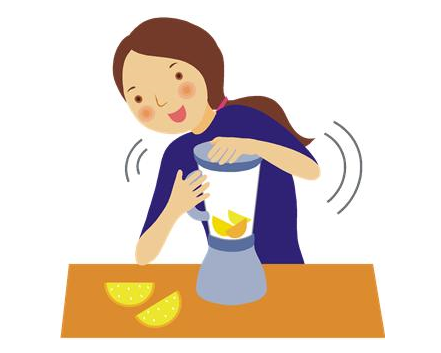 Your kids could easily make their own smoothies this way (with your supervision). And 2) The food processor attachments mean you could legitimately replace your food processor. It has more power than the 1100, and if you shop with a coupon, you can get it for under $200. (I bought mine with a 20% off coupon at Bed Bath & Beyond). While the Vitamix can make smoother green smoothies faster, the Ninja can do a whole lot more, like make DIY Lara bars, due to the “through the middle” blade design. Angie, put your money to the Ninja Mega Kitchen System 1500. I bought it two months ago and it IS AWESOME and much more versatile than the VitaMix, as Angela said. So far I’ve made three kinds of ice cream, pulp free smoothies and green drinks (using ice to break up everything) and ground chicken and turkey breasts and thighs for burger meat (using the 8 cup processing bowl) I’ve also made batters for corn bread casserole (instead of mixing by hand) and cookies. As Angela said, there are many coupons out there to bring the cost down. I got lucky, I got Kohl’s to price match a competing store price, then used a 30% off coupon and a small credit I had there, so my total for this KS was $139, including tax. The store models do not come with the BIG recipe book that the informercial gives. Also now the informercial is giving the attachment that you hook up to the KS to slice, grate, julienne, make french fries, etc for free…that is also not included in the store models, but no biggie, I don’t miss not having that. BUT if you go onto Ninja’s facebook page and request a recipe, such as the Peach Ice Cream or some of the salad dressings, they will post them for you, so no need really for the recipe book. I recently purchased the Ninja Mega 1500 watt system and I absolutely LOVE it. But now my daughter is jealous. 🙂 I plan to get her a Ninja for her birthday but she really doesn’t need the food processer part, so, I was wondering does the 1100 watt Ninja blender with single serve cups chop up avocado seeds? I know the 1500 watt does. Thank you!! Interesting question – I have never tried to chop up an avocado seed. Out of curiosity, what do you do with it when it’s chopped? I will say that if you can do it in the 1500 72 ounce pitcher, you will be able to do it in the 1100 72 ounce pitcher. The 1100 has ample power, and can grind up dried chickpeas with ease, which is what I use to measure its ability to grind anything hard. Mine is currently in storage due to our current remodel, so I only have the 1500 and Pulse handy, or I’d try it out for you. Known for its pulp that can be crushed up into guacamole or cut up for use in salads and other dishes, the avocado also contains nutrients in the large seed or pit. Containing fatty acids, alcohols and unsaturated compounds, the pit is also a good source of soluble fiber, which helps lower cholesterol and improve heart function. American Indians used avocado seeds to treat dysentery and diarrhea. Avocado seeds also pack a bitter taste that results from the tannins they carry. Despite the bitter taste, you can eat the avocado seed for its nutritional value, but you should be careful because in large quantities the avocado pit can be toxic. I throw the seed in when I use the blender when I make my smoothies…..chops it up really fine. Try it….you just might like it. Fascinating, Deborah, I had no idea. I will definitely give this a try, as I use an avocado in my smoothies almost every day. Brilliant – thanks for the tip! I am new to Ninja Mega System. When you blend fruits, like orange, grapefruit, lemon, do you leave the peel on? What about banana, apples, peaches, pears, etc.? It all depends on whether or not you want to eat the peel or not. The Ninja can more than handle blending the peel of any fruit or veggie, but, keep in mind that the peel will then be in your mixture. So, personally, I peel most things that I would normally peel to eat (banana, lemon, etc.) and leave the peel on for things I would leave the peel on to eat (apple, peach, pear). Can you make whipped cream in the small Ninja blender??? Please do let us know how the coconut whipped cream turns out Angela…I am not sure how I would go about doing it since the Ninja Mega does not have an aeration attachment, and the bowl is plastic as is the dough hook. Most of the time you need a chilled metal bowl for proper whipped cream consistency, I’m not seeing how the metal blade could provide enough aeration to whip up cream or coconut milk either…but if you have success, please share :))) Thanks so much!! Hi Paul, will do! I have the same concerns you do, so I’m going to do this as a “test” to see what happens! I didn’t know you even had this FAQ page Angela. I’m posting so I can subscribe to it by email. Would you believe I’m thinking if buying the ninja again? Now that I’m into smoothies I think it might be a good for for me this time. I won’t get the pulse though. I don’t think it was powerful enough for me. We will see in a few months if I’m still into smoothies and I’ll buy one. I can believe you are thinking of buying a Ninja again, because I saw that you are really enjoying your smoothies now! 🙂 If the Pulse wasn’t powerful enough for you, I would steer you towards the Mega KS, because it can just do so much, and if you use a 20% BB&B coupon, you can really get a good deal. Do you have the citrus sun drenched salad dressing recipe that is in the infomercial? Sorry, Richard, I don’t. But, I am pretty sure if you reach out to the Ninja Folks they would probably share it. Just try the “live chat” feature on their page: http://www.ninjakitchen.com/recipes.shtml. Or, maybe ask them on their Facebook page (Ninja Kitchen). I did find this one that seems like it could be close – it sounds pretty good to me! Thanks. Will try them. Really do appreciate your web site- full of very useful ideas and information. Paul, you are the best, thank you for finding this! No worries at all. Glad I could help! I just purchased my Ninja professional. What I have not found in the receipes is for the 16 oz container. Most of the receipes are for the 40 oz or 72 oz bowl. I would love to make my green smoothies in the 16 oz………….just don’t know the quanity of veges or fruits for that container. Then, add your other ingredients — usually I do a small banana, 1/4 cup of frozen fruit to make it cold, half an avocado and some protein powder, and that all fits. Just keep it below the “fill line” and you’ll be good. Thank you so much……………going to give it a shot now!!! I had purchased the NutriBullet in a previous life, so I had all their “blast” recipes, and used those for my 1500 Ninja, and I single-serve every day. The Ninja does a wonderful job on anything you put in it. Also, I understand from their book that one should core apples before blending, as the seeds are capable of producing a certain poison. You are totally right – apples must be cored, as apple seeds contain arsenic…so coring them is a very important precaution! I now have my ninja 1500. What is the best recipe book to get that will tell me how to use my ninja with each recipe? Basically, and honestly (and humorously haha), I’m cheap and will not pay extra for a recipe book from them when I paid the money I did for the Mega Kitchen System. I did get it much less expensive from Kohls and worked out an amazing deal with the manager, but I didn’t get the recipe book nor did I get that attachment that the informercial is offering now that you hook up and it slices vegetables, makes french fries and grates cheese…but no matter, I am happy to chop all that by hand. If I can help in any way to get you some recipes, let me know…and if you really want that recipe book from the informercial, you can order it from Ninja or maybe Amazon? But like I say, this site of Angela’s has a great number of recipes that seem amazing to me. Suzanne, all of my Ninja recipes give instructions for using in the Ninja Professional/Mega/Pulse, so hopefully that will help. Pinterest is a great potential resource as well. There are a lot of food bloggers out there writing recipes for the Ninjas these days. Have you had a chance to use the new Ninja Ultima that they are comparing to the Vitamix? Does the Ninja Professional Prep System offer a julienne disc? I have the other 4 discs but am in need of one that makes “matchstick” cuts. I don’t understand. Mine did not come with any disc or anything for $219? Just found your site today (GREAT site it is now bookmarked) I got a Ninja 3-in-1 cook system at Christmas and love it (I don’t like to cook but I have not found a way to convince my family not to eat) I have now been looking at the Euro-Pro Sales QB1004 Ninja MasterPrep Professional Blender (I only use a blender for my smoothies so no need for high end model) I think this will work for me but I love single-serve cups (only one thing to clean) do you or someone that posts here know if the single-serve cups crush ice (I use frozen fruit) like the other models will make “snow from ice” Thanks for any help you can offer. The single serve cups can make snow from ice, but you have to be careful as it is easy to take it a little too far and just have “slush.” 🙂 This is because the blade design is different from the larger pitchers (more like a normal blender blade). I use the single serve cups every single day to make smoothies for exactly the reason you stated – only one thing to wash! The single serve cups can make a really smooth smoothie. Thank you so much for your response !! I have also looked EVERYWHERE for this book, I’m definitely going to check out Kohl’s tomorrow thanks Paul! Hi, I am from Australia and would love a copy of “Ninja 101 Frozen, decadent desserts, drinks & treats”. Does anyone know where I can get a copy? I own the 600 and shattered the lid. Can the lid from another model, (like the 1200) be interchanged? Dang. Ebay has a 1200 lid for $1.00. 600 lids go for $20. Rats! Maybe set up an rss feed on Ebay for new listings of the 600 lid! Just found this site in my weeks long search for a replacement for my old blender!!! Arrgh! Lots of great info here. My kids are mostly gone so I really have no need for a larger blender. I still have a great working food processor as well as a mixer, so not looking to replace those. What I want is a better version of The Majic Bullet that I just tried at my daughters. It can’t do what I want but I loved the size and clean-up ease. I am looking at the Ninja Pulse BL204. It seems to have gotten good reviews and there are only a few left out there. I like the price and the 700 watts. I want to make bullet coffees and green smoothies. I don’t need the green smoothies to be flawlessy smooth but not bunny vomit either….it’s a texture thing!!!! What do you think? I am afraid that the larger Ninjas will be too much for my needs. Thanks! The Pulse is what I gave my Mother-in-Law and she loves it. It will do everything you want and not take up too much space. The single serve cups make very smooth green smoothies. And, 700 watts is ample power for most everything you want to do, especially if you have a food processor. You say that you can make dough with the 1500. I recently purchased one and have tried several times to make buns or rolls and they won’t rise. It acts like the machine kills the yeast. I have tried it on pulse and dough and variations of placement of yeast but no success yet. My bread machine recently died and so thought the Ninja would be nice but now I’m ready to go buy another bread machine. Any suggestions? Yes, technically the Ninja can make the dough, but only the ingredient combining party – you still have to set the dough aside to let it rise if it’s a yeast bread. Truthfully, I make dough in my bread machine, which is just a plain Jane model: http://amzn.to/KopenT. I got into bread making before I started the blog, so I didn’t do a lot of research – just looked for one that seemed simple, and this one is easy to use and works fine. However, reader Janis has done a lot of research on bread makers, and reported back that she settled on this one: http://amzn.to/1kommbj because of its good reviews and functionality. One thing I used to do when I had a full kitchen (we are in a remodel right now) was make the dough in the bread machine, then put it into a bread pan, let it rise again, and bake in the oven. My hubby just couldn’t get over the odd shape of bread machine bread, so this workaround was good for us. Thanks for your quick reply, Angela. Yes, I have left the buns or rolls raise overnight and they still don’t raise. I used the bread machine the way you are….make the dough and put in pan and leave raise but my husband had the great idea that since we weren’t using the bread machine for baking why but another bread machine. Why wouldn’t the Ninja be the way to go. Make the dough and put it in the pan to raise. I use the same recipe from the bread machine but it just doesn’t raise. Haha Angela, I told her the opposite. Ii was probably using instant yeast when I did my experimenting but I use active dry now and I’ve not tried it in the processor. So you could be correct! Barb, I thought I’d jump in. I have a couple of ideas, did ou check your yeast to make sure it’s still good? Amd secondly, it sounds like the dough is either not kneaded enough or kneaded too long. My guess is it might not be long enough which would not allow the gluten strands to develop properly. You don’t want to allow the dough to get warmer than 80F – so it’s possible that you are killing the yeast if your dough temp is higher. I don’t know if you’re activating your yeast ahead of time with warm water but I never do and it works fine. I am the same as you and Angela in that I use my bread machine only for kneading. Debbie, you are the best, as usual — thanks for these tips and the link to your notes! It takes a village, you know. 🙂 And I think we all agree – the bread make does a great job of mixing/preparing dough…as I guess it should! And, regarding the yeast, you’re totally right in your second comment. It totally depends on the type of yeast if you need to proof it or not. I received your posts late last night and thought about your comments. I didn’t think I needed to proof the yeast because I’ve been using the instant rise yeast and it is fresh by date anyway. And right, Debbie, you don’t have to proof it with a bread machine. I haven’t been taking the temp of the water I’ve been using. I layed awake last night thinking of ways to try again and got up at a quarter to five this morning (my husband already knows I’m crazy) and tried again before going to work. I dissolved the yeast in a little water that was 110 degrees with a little sugar and it doubled in size so yeast was good. In the meantime I put my flour, sugar and salt in the bowl, added three tbls of hard butter and poured the yeast mixture over the top. I pulsed it for a few seconds and then put it on dough. Then I added the remaining water. It formed a ball. I made rolls, put in pan and left rise for over an hour. Didn’t raise much but maybe I’m on the right track. Do you think it would work better to put the dissolved yeast mixture in first and add the remaining water and the butter and then put the flour mixture on top? And probably use room temp butter so it is soft? Thanks for helping me remain sane. What is your flour to water ratio and are you measuring or weighing your ingredients? I’m wondering if you’re not using enough water. Are you following your older recipe or one for the ninja? And just to clarify, Angela, why is proofing active dry yeast necessary in the food processor vs the bread maker? I use active dry now and never proof but I’m not using the processor so I don’t know what would make a difference. What have you learned? I am basically using my bread machine recipe which calls for 3/4 plus 3 tbsp. water, 3½ tbsp sugar, ½ salt, 3 tbsp butter, one package of yeast and 3 cups flour. Flour is measured with knife. I received no bread recipes with my Ninja other than a pizza dough recipe. I also tried the banana bread recipe in their pamphlet and that didn’t raise either. I use the Red Star quick rise instant yeast and have also tried the rapid rise active yeast. They both say on the package to either mix with water or add to dry ingredients. I am going to taste the buns tonight I made this morning and see how they are. I talked to a friend of mine this noon and just realized that she is having the same rising issue. Thanks for all your advice. Barb, you really have given this the full college try. One last suggestion I have is to ask the folks at Ninja directly. They are really quite helpful on chat – http://www.ninjakitchen.com/. But, I agree with Debbie, the bread machine may be necessary, though I know that stinks. 🙁 I haven’t tried to make any bread products aside from cookie dough, which doesn’t need to rise. And, we don’t have an oven right now due to a remodel, or I’d give it a shot for you. Sorry Barb!! Thanks to both of you, Angela and Debbie. I appreciate all your comments. The buns I made yesterday are the best in my trials so will try once more to perfect it. I did try the Ninja chat too and no one knew anything there. Have a good summer. Just my opinion but maybe add a little more water. Or it could be that the ninja just doesn’t make good bread dough. I’m sorry. You might have to just get a new bread machine. Hi Angela, just stumbled across this trying to decide if I should buy a new blender or not. I currently have a Black and Decker 500 watt blender and it was able to blend my spinach, strawberry, and bannana smoothie yesterday quite well with the aide of milk and vanilla yogurt. However, today I made a smoothie with green apple, bannana, and milk and it was pulpy and almost to the point where I could not drink it. So added a lot more milk which made a it drinkable but not nearly as well as my previous smoothie yesterday. I looked at the Ninja Mehga Kitchen Pack and it comes with a ton of extras for $179.99 but I am only 16 and I am not sure if I want to blow that much on a blender. I plan on using it frequently (every day or every other day) as I just came into green smoothies and such. My current blender is ok but it doesn’t break up ice that fantastic and it leaks on the bottom no matter how tight it is. It blends stuff pretty smooth but it will be such a pain to clean the ridged bottom everytime I use it and I want to extend into new forms of green smoothies and other of the great things I see people making in their blenders (nut butters, salsa, ice cream, etc) Sorry for the long post but I don’t know if I should put up with my half-decent blender or spend $180 on the Ninga Mega. I think you can’t go wrong with the Ninja Mega for what you want to do. If you can get a Bed Bath and Beyond 20% coupon (just sign up for their newsletter), you can bring down the price significantly (though you won’t get all the extras you mentioned that come straight from the manufacturer). The single serve cup that comes with the Mega KS is huge for me, and it makes very, very smooth green smoothies. It’s also very easy to clean as a whole. You can do much more with the Mega than a traditional blender, since it also has food processing capabilities. However, you also need much more space to store it because it comes with a lot of different accessories. You are certainly going to use it enough to warrant it, but I really think it comes down to if you have the budget to splurge on a blender! Thank you so much for the response. Money is not exactly a problem, I just don’t like to spend stuff on things without thinking about it heavily. I do have an extremely awesome Kitchenaide stand mixer for dough but I do not have a food processor. The Ninja Ultima is also on my radar since one from BBB will be even cheaper then the Ninja Mega offer but it only has the single serve cups. Should I just buy the cheapest model (Ninja Professional with the single serve) and work my way up or does the Professional not have enough power? The questions in my head are simply endless. Do I go for power or price? Oh and just to add, storage is plentiful in my house so size and space for attachments and such isn’t a problem. With that little bit of extra context, I can tell you a few more things. I have the following models (from all the reviews I’ve done): Ninja Professional, Ninja Pulse, and Ninja Mega KS. As far as power, there is no real discernible difference between the Ninja Pro and Mega KS. They are both very, very powerful (check out both of my full reviews if you haven’t yet – they are linked in my sidebar). My Ninja Pro doesn’t have the single serve because they didn’t make one back then, but like you said, that is an option now. The Ultima is on my radar to review in the coming months, so I can’t give you a lot of info there, but I think it might be good for you. The reason I think you might like it is that the blade for the larger pitcher is sort of a hybrid between the standard 3-pronged Ninja blade that goes up the center with a traditional blender, with the blades at the bottom. This will provide the super ability to chew up just about anything, but also pulverize greens. One gripe about the large pitchers on the Ninja Pro and Mega is that they don’t pulverize greens very well for green smoothies. The single serve cups have the blades more like a traditional blender, and they blend greens to smithereens and make very nice green smoothies. But, some people want to blend their greens in the large pitchers, and this is where I think Ultima will win. You may want to go into a Target or BBB and take a look at the display models for a better view of what I’m talking about with the different blade designs. If you don’t need food processing capabilities, which it sounds like you really don’t, either the Ninja Pro with the single serves or the Ultima will probably suit you best. I hope that helps, and let me know if you have any other questions! And, please let me know what you decide! Thank you again Angela! Just one last set of questions. I want to get into like I said before the ice creams, salsas, nut butters, and the other things I have heard people making in their blenders. Do I need that processor attachment and all of the attachments that come with it (included in the manufacturers package) to do that stuff or can I make all those creations in a Ninja Ultima or Professional with only single serve cups? You can do all of that stuff in the 72 ounce pitchers with the Pro or Ultima, or single serve cups. Have a look through my Ninja Blender Recipes page for lots of examples of what you can make. Very few of my recipes use the food processor bowls. The pitcher is where you would make your ice cream, salsa, nut butter, and the single serve is the best way to make smoothies. Angela…..I have been reading your comments to Eric on purchasing a Ninja. I am the one who was having all the trouble mixing a yeast bread in the dough bowl. Nothing has worked so I am to believe that the dough bowl is just for cookie or pizza dough and not for bread or buns that need raising. You mentioned that ice cream can be made in the blender. I saw a recipe for blending 1 cup of coconut milk and 2 frozen bananas to have ice cream. I tried that and even put it in the freezer for an hour and all I had was a slushy mix to drink. Any ideas. I think this Ninja is out to get me. I would tend to agree with you that the Ninja is not best for dough that needs to rise, but fine for cookie dough, pizza dough, etc. As far as the ice cream you mentioned, are you using thick coconut milk from a can (or tetrapak) and not coconut milk beverage? You need the thicker coconut milk for this to work. If you are doing that and still having issues, try adding less coconut milk. I would start with as little as 1/2 cup coconut milk and then if that is too thick, add a little at a time to figure out the proper portion for you. But, I have never had anyone say that recipe comes out slushy, so I’m wondering if your bananas are small or your coconut milk is coconut milk beverage. Just some ideas! I bought that in a box so that could be the problem. I will try the can which I think is thicker. It had a good flavor so will try it again. Barb, I think that a stand mixer with a dough hook is much different than in a blender as the blender is kneading from the bottom rather than from the top. And Angela I will be deciding between the ninja ultima and the ninja professional later tonight and thank you for the BBB 20% off it will really help but what is the warrenty like from BBB? Eric, I think the warranty from BBB is one year, but of all the stores, they are really the best with return policy. I have yet to have an issue with any of my Ninjas, though, so I can’t say I’ve needed to make any kind of claim. It looks like you decided on the Ultima with single serve. I think that’s a good call for what you need. Come back and let us know how you like it. I need to review that model soon! Hey there, chiming in about the ice cream. I’ve used frozen bananas and frozen peaches with both coconut milk from a can and very cold half and half. I use the food processor bowl that came with the Mega KS. I also make sure that bowl and blade are cold (fridge, not freezer) and have had every batch turn out awesome. I make a version of Ben and Jerry’s Chunky Monkey with chips and nuts and love it. It will not taste exactly like ice cream, but it’s a close knock off. The recipe from Ninja for peach ice cream is lousy…they call for maple syrup and I am just not a fan of that, I use the same base recipe with the coconut milk, but no bananas, and it’s more a sherbet type texture. I am planning on getting the ninja ultima with the single serve as it will not be too much with the 20% off from BBB the one with the attachments is just too much unfortunately. But thank you for the input. Paul, thanks as always for your thoughtful input! BTW, for those following about the ice cream in the Ninja, here is my take on peach ice cream: http://testkitchentuesday.com/2013/07/09/peach-soft-serve-in-the-ninja-blender/. I just realized I don’t have it listed in the Ninja recipe directory. And, here is a take on chunky monkey: http://testkitchentuesday.com/2013/02/04/chunky-monkey-that-wont-make-you-chunky/. There are so many ways to make nice ice cream/soft serve in the Ninja – you just need to make sure to not get too much liquid in the mix and you’ll be in good shape. Eric, I can tell you, you’ll be happy with whichever one you choose. I have yet to meet a Ninja product I don’t like. If the Ultima is 1500 watts, then it has the same power as the Mega (which by the way, is A LOT). If you are going for the best value, based on what you’ve said I think the Mega probably wins. You never know if you might want to make things with all those food processing attachments (read the review from Mr. Bob that published on Monday about all the attachments and how to use them). The Ultima is their “newest” model, so it has all the attention right now (plus it is trying to directly compete with Vitamix). If you buy from Ninja directly, I think the warranty is longer, so maybe check on that too. Your right, the value is defineatly there on the Ninja Mega. I am going to get the Mega. I will tell in a few days when it arrives how it is! Thank you all for your help. Glad to have helped, Eric. I hope you whip up lots of tasty food! I just got my Ninja blender today and ended up getting the Ninja Professional as it was on sale at BBB and I just made my first smoothie and it is incredibly gritty and not smooth whatsoever. I hope I didn’t just waste my money, what is wrong!?! What did you put in it? Did you use the single serve or pitcher? The single serve is preferred for smoothies with greens because it makes a smoother consistency. Keep in mind, you can take it back to BBB if you don’t like it, even if it’s used! We decided to buy the one without the single serve. Is it because there are little ingredients because I am only making one serving? I took the stuff from the ninja an put it in my black and decker and it made it smooth… Should I go back and trade it for the single serve option? Eric, I am going to kinda give it to you straight up…I have looked at most of the Ninja’s before I bought my Mega KS. I have also seen different shopping channels demoing all the models, most reccently the Ultima. If you are wanting to make your smoothies totally pureed and smooth, with no grit, pulp ot texture, you need to invest in the Ultima, period. It is 2 horsepower with I believe over 1200 watts (which is what the Mega has). The reason I say this is because of the double blade system, the normal triple Ninja blades, but the one at the bottom. The Ultima also has the variable speed option like the Vitamix…you start off slow to start it going, and then turn the dial to raise the speed as the smoothie breaks down and begins to become more pureed…then finally full speed to get it all done. They demoed this one on one of the home shopping channels and every smoothie, both green and ones that were fruit based, came out smoothly pureed and no grit at all. Honestly, you bought one of the lower level models (my friend bought the same one) which is one of the lower in horsepower and wattage ones and it just doesn’t have the power that one of the upper level ones do. Even the one I have (again the Mega) is not strong enough to break down an apple all the way, I still have some pulp and texture when I try. I don’t make green smoothies in mine though, I make frozen alcoholic drinks for parties, and mine has no tourble crushing ice and breaking down strawberry, mango, pineapple, even pomegranate seeds. So with that said, I would go to Kohls, not BBB, mainly because they run better sales, you can get Kohls bucks, and when they have their 15%-30% off sale (depending which card you draw) that takes even more off the price. Additionally, Kohl’s return policy is WAY better than BBB. You can return any item you bought there, at ANY TIME, for ANY reason, no matter what. Totally agree Paul. The blade structure is what’s really important in the end. The blades up the middle are great for some things and not great for others, which is why I mostly make smoothies in the single serve and use the pitcher for things like nut butter and salsa. The blended blade in the Ultima likely solve that problem if budget allows. Thanks for adding your voice to the discussion. I really need to get an Ultima and review it…just need the time to do it! I love that you have this board for all discussions about Ninja products where we can share our results and opinions. Can I use the gift card with the purchase? The Ninja Ultima was $195 at BBB and if I decide to return my Professional than that would be the place unless I can use that gift card on the purchase. No you cannot use it with purchase, you get it after the purchase for a future buy. BUT in my opinion, Walmart is the better buy since you get $50 for buying it. You get nothing extra from buying it at BBB, nothing on a future purchase, and no extra bucks like at Kohls…your option of course, but in all reality, you can’t tell me you won’t need something from Walmart in the future to use that $50 for…I’m always running there for things that come up in everyday life that I need. Just wanted to share the info with you. 🙂 Good luck. Interesting, Paul, thanks for adding that. Thanks for the tip on the Ultima, too. I need to mosey down to Wal-Mart today and take advantage! You’re welcome about the Walmart info…hope you can get the deal and happy to let everyone know…just happened across is this morning…I was late in reading the Sunday paper’s ads. I just ordered the Ultima from Walmart.com and also put it up on the TKT FB page, so others can take advantage as well, so thanks again! Can’t wait for that review Angela it will judge wether I sent my professional back to the store or not for the ultima. Eric, I would say don’t wait on my review! It will be a week or so before it gets here, then I need a few weeks to play with it and get the review together. However, if you’ll send me the ingredients you are putting in your smoothie, I can make a video of the Ultima making your specific smoothie prior to doing the full review. Also, I may be able to help you more if I know the ingredient ratios. If you are using apples, the best thing to do would be to steam them first (like you would steam veggies) so they are very soft. In any case, I would say if you have any inkling to take back what you bought, do it sooner than later and keep thinking/researching! Angela, from what I saw on two home shopping channels, which both demoed the Ultima, and they used the pitcher, not the single serves, it broke down EVERYTHING they put into it, (kale, spinach leaves, all things green) and it pureed the stuff to perfection. Hopefullyyou have the same result. As I said, I didn’t read, or see in the picture, that this model comes with the single serves or blades for those, but the pitcher with the two blades and the 1-10 variable speed control dial, (WHICH I WISH I had that on my Mega KS) should duplicate exactly what they did on the shows. I will be very interested in your test results. LOL @ Crazy cat lady. There is one more higher end Ultima Ultima model that I’ve only seen at BBB…It comes with the food processing bowl (like the Mega) and sets of grating blades for that, plus a food chute where you can insert food to grate, like carrots, cheese, etc, but even better, you can make pesto and dips in the bowl now where you need to stream in things like butter or olive oil while the machine is running. I cannot do that in my KS becase the bowl does not have an opening to lift and pour in. I hate making pesto and dips and things like that in the pitcher, even though the pitcher has the flip top, because it’s hard to get it all out into a bowl to the largeness of it. Also the blade system does mush the stuff on the bottom and leaves more chunkier stuff up top…but when I mix it together in the bowl I pour the mixture into, it kind of works. Eric, this must be your lucky week…I just read the Walmart ad and they have the Ninja Ultima on sale for $199…AND from what I saw, you get a $50 Walmart gift card with purchase…I didn’t see or read about the single serve cups or blades coming with this model, but you can buy them from Ninja directly or check ebay or amazon too. I would JUMP on this deal, it’s the lowest price I’ve ever seen for the Ultima and with the bonus gift card, it would be an awesome purchase. This would definitly solve your problem with the green smoothies. Good luck. Sounds great I will try it tomorrow right after schooling just want to have smooth smoothies I tried apples and didn’t like the taste anyway. Thank you for the tip and the articles. Can my blender handle nutt butters? Any recipes for healthy ice cream? I tried your recipe, Angela, for the chunky monkey ice cream last night and because I had big bananas used a half cup of cold coconut milk and from the can this time. It still didn’t get thick….more like a thin malt. I put it in the freezer for an hour and it still didn’t get very hard. Should I try less milk next time? Barb, I’m not sure why you are having this issue with the thin consistency! I have never had that happen. I would definitely advise less milk if this continues to happen. Start with 2 frozen bananas and 1/4 cup of coconut milk, and blend it all up. If it is too thick, add just a bit more milk at a time until you get a thickness you desire. And, please, let me know what ends up being the magic ratio for you! Yes, I used frozen bananas and broke them in pieces but it wasn’t near the consistency of even soft serve. I will try 1/4 cup milk the next time and see if that makes a difference. Barb, this is really perplexing me! You did everything right – definitely use less milk next time. I hope it tasted good at least! I am really enjoying your conversations and THANK you for all the great informaiton. I am in the midst of buying my 1st Ninja and have not read any reviews on how the Ninja Mega works with the prep system in cutting french fries. Can someone please advise if they have used this function/feature with the Ninja Mega and what your thoughts are. I am considering the Ultima, but the Prep system is something that is very intreging to me for the cutting aspect that shoots the cut items right into a separate bowl instead of the same bowl. Has anyone used the Mega to cut potatoes into fries? I have an Ultima on order and expect to write a review in the next month or so, but if you want food processing, the Mega is where it’s at. The “cutting potatoes” is definitely something that has been of interest, however, after reading the review and having to cut the potato down to a specific size, I will need to weigh this out with my husband. We grow our own potatoes and make french fries every year, so this option was something that sounded like it could take some time off our efforts, but we also have another MANUAL process (looks like a manual meat grinder in concept) to cut the potatoes whole without having to cut in chunks, so that may or may not be a big reason to stick with the Mega. I do however, like how the Prep allows you to shoot the finished product into a separate bowl…but again, not sure if this is really my “selling” point. I currently own a KitchenAid Stand Mixer and also a Cuisineart that can perform a bunch of the food prep options, so this is where I am stuck. I am not sure that I will get rid of my other appliances once I purchase my Ninja. I think having a second for group cooking at the house is a great thing. The start of all this really came from wanting to make adult mixed frozen drinks from a trip we just came back from and not having a blender was key to quickly find one. The only other thing that would be interesting to perform is baby foods, which again leads me to the Ultima for fine blending. The Mega options with the tray for ice cream and molds is also a nice have, but again, I guess for everyone, it is what you plan to use the blender for. Thank you again for all the posting. The link was very helpful…just need to share with my husband to get his take on which way he thinks we should do the fries! Ah, I see. That is an interesting crossroads. One of the things I plan to do when I review the Ultima is make a chart that shows what kinds of work each of the main Ninja blenders is good for, but, from what I can tell the Ultima should be excellent at making really smooth drinks, sauces, baby food, etc. The Ninja Blades in the non-Ultima model are great for a lot of things, but, the Ultima blade, which is sort of a hybrid of a Ninja and standard blade design, should be superior for smoothness. Hi, does ninja professional blenderBL550 use the same jar as the ninja professional blender NJ600??? discerning by your post you almost said no. One thing I’ve learned about Ninja products is that nothing is interchangeable, sadly. So, if you broke a pitcher, for example, you need to replace it with the pitcher from the exact same model, from what I understand. Hi Kim…I own the Mega and I’ve never tried to puree cooked chicken breast by itself, only when I’ve made chicken salad with mayo in the processor bowl, using the plastic blade so I didn’t come out as mush. I’ve only pureed raw chicken breast by itself to make chicken burgers, and when I did that, I used the metal blade and did add about a tablespoon of chicken broth just to get it going. The finished product was not liquidy at all as it was absorbed into the meat. Depending on what you want to do with the cooked chicken breast, I am guessing that you can use the metal blade to puree the chicken breast to the texture you want without a ton of liquid, again I would use about a teaspoon or two of chicken broth or stock, and I think it will get absorbed into the cooked chicken. I also think this will aid in keeping it moist if it cools down since chicken breast usually gets to be a bit dry once it cools. Hope this helps a bit. Have a good day! Thank you Paul for your timely help, as always! Hi Paul, Thank you. I have actually been able to purée the cooked chicken breast in my food processor attachment with adding some chicken broth, usually two tablespoons or so. I am hoping not to have to add any liquid, but since you say you only had to add a couple teaspoons, that’s better for my purposes. I am considering the investment into the Ninja. No problem…When I bought my Mega, I put it through every test from the informercial to make sure they didn’t lie…so far, everythings been great except trying to make tuna salad or chicken salad using canned meat. No matter what, the processor bowl makes MUSH. I only use REAL meat or fish now for salads or seafood cakes. The single serve cups are not interchangeable, so you couldn’t use Ninja Professional single serve cups with a Ninja Ultima, but you should be able to use accessories within the same line, if that makes sense. I haven’t had the Nija for a month and somehow I got the jar stuck on the base. My son usually uses it and he said I put it on wrong, therefore it is stuck. I probably did replace the jar after washing, but don’t recall that is was difficult to put on so it hard believe that it is not stuck. Sorry I don’t have an answer for you! Where can I find the Ninja 101 Frozen Decadent Desserts Drinks & Treat book? I just got the Ninja Mega Kitchen System 1500. Thanks so much. Just curious if you are able to blend very hot liquids in any of the blenders. I make a coffee drink with either a couple shots of espresso or some freshly brewed coffee. I have tried making this in my current blender and it seems to have almost melted the lid and seals. Don’t want to buy a new blender only to have it ruined by this drink. My apologies for the delay here – I am just now seeing your comment for some reason. Yes, you can blend very hot liquids, no problem at all. I blend hot soup (butternut squash) and have not experienced any issues at all. My old blender died and I have ordered your 1000 watt Ninja Professional Blender, which I have not received yet and I need information on using it to make Potato Pancakes, which the potatoes need to be very finely grated and I would also like to know about finely grating carrots for carrot jello. I have found most blenders can’t get these vegetables grated fine enough. I’m hoping you can advise me on how to do it. I think the Ninja will grate your potatoes finely enough for your pancakes, but not so sure about the carrots. When you get it, you’ll see that just by pulsing the items you can grate them to a certain point, which will be better than a normal blender due to the blade design. Just be careful not to overpulse, or you’ll end up with liquid ingredients. Just chop them roughly, add to the blender jar, and pulse 5-6 times to start, and continue pulsing in 1-2 pulse increments until you get a texture you want. Does anyone know where I can purchase the book “101 frozen decadent desserts” from online plz?? I was wondering if any one has ever tried using the 64 oz food processor on the ninja BL640? I read pieces are not interchangeable. I’m hoping someone tried it anyway and it worked! After blending a smoothie together can you put the single serving cups in the freezer over night or will the cups crack? I have the same question as Bethany. Can the cups withstand freezing? I have honestly never tried this. I would think they should be fine, so long as you leave enough of an air gap for expansion and contraction (if you put a lid on them). Hi I just wanted to say that I found this website when I wanted to know if the Ninja could blend hot soup. You state multiple times that you can blend hot soup in the Ninja. I just tried to do so and it cut off and will not start back up. In the manual you get with the blender it says that you should Not blend hot soup in the Ninja. I really love this blender and it helps because of my strict diet. I believe i threw away the receipt and now have to figure out what to do. That is strange – I have blended hot soup dozens and dozens of times with no issues. The Ninja can’t create hot soup like a Vitamix can, which is what I think they mean in the directions. However, I have not had any issues over the years blending up soup that is already hot from the stove. It shouldn’t impact the motor at all. I would suggest contacting Ninja Support and seeing if there is something else wrong with your blender. They have a very good warranty so they may be able to help you. I’m trying to decide between the Ninja Mega KS and Ultima KS to have a blender/food processor combo appliance in our kitchen. We are in the market for a food processor, specifically, but we like the versatility that systems like Ninja’s offer. Have you noted any significant differences in performance between the Ultima and Mega food processor attachments? I have noticed that the Ultima attachment has that feeding column that we find on dedicated food processors while the Mega attachment does not. How would not having the column affect the usability of the attachment? TIA. I’m afraid I won’t be much help on this one, sorry! I don’t have the food processor components for the Ultima. I can tell you that as a blender, I do prefer the Mega. The Ultima is good at making super smooth green smoothies, but it falls short of the Mega in a lot of ways due to the two layered blade design – food just gets caught up in it a lot, and that never happens with the Mega. I am totally bummed that I cannot order a larger cup from one unit to work on my Ninja Mega. I find this a major flaw that there is not even the option to order one at all. Even as an add on feature. Argh! Hi my question is potentially one you may have answered and I missed it trying to read through all the amazing questions and responses on here. So here it goes. Well I have 2 now that I think of it but I will start with the one that brought me here. 1.) I have the (I think original) Ninja I think it is called the Ninja Professional Blrnder. It came with a base a jar a blade and a lid. My question is, I was wondering if there are any types of different blades or attachments I can get for it. I want to get like a paddle attachment for mixing up like cake batters. (Right now I have no mixer hand held or otherwise because I just moved.) I don’t want to spend hundreds on a whole new system if I don’t have to. So far it has always worked for everything else I have ever needed it for. 2.) This question I thought of just now because I’m a live in nanny for a 12 month old and o know how much we spend on baby food. Is there a way to make baby food in the Ninja? I want to maybe try so we can save a little money. 1) Unfortunately, no. The original Ninja Professional Blender doesn’t have any accessories that I know about, and, the way Ninja designs stuff is that nothing is interchangeable across models (which stinks, IMO). You can probably mix cake batter with the standard blade though – I don’t see why not – just use the lowest speed. 2) You can totally make baby food in the Ninja. We don’t have kids, so I don’t have any baby food recipes, but it can be done. If you do a search for recipes and find ones you like that are made in a vitamix or food processor, they can be done in the Ninja. The inside of my pitcher handle is foggy and seems to have food or possibly mold growing in it, but I cannot figure out how to separate the black piece to clean the inside of the handle. I ieven unscrewed the bottom, but the black piece is not coming off. Any suggestions? I have a Ninja 1000 3 Speed and I need a new 72 ounce pitcher, are any of the 72 ounce pitcher’s compatable to each other? 1, 2, 3 or pulse speeds. pulse did how ever make more noise. Question: My daughter didn’t screw the top on the smoothie she was making and orange juice leaked down and into the base. Its the Auto-iq model BL682. Is this going to ruin my Ninja? Its working at the moment but the hole on the top of the motor unit looks like it would funnel liquid strait into the motor. Hmm, I am not familiar with that model, unfortunately. If you run into troubles, I would contact the Ninja folks directly via their website. They are generally very helpful and responsive. Your Ninja should have a warranty, so hopefully they can help. Hi, just purchased ninja duo, wondering if you can grind to powder form spices like, coriander ,cumin ect? I’m not familiar with the Ninja duo, but if you have a single serve cup, you can definitely grind to a powder. The big jar/blade combo won’t produce a fine powder, but the single serve cup will. Hi there! great ifo here. I am just finding it now, but I’ve used a ninja for years! Anyway, I have the Ultima with single serve cups, and it’s used almost exclusively for smoothies. Love it. I was wondering in the single serving cups are freezer safe? I want to make my smoothies ahead of time and maybe move them to the fridge the night before so they’d be drinkable but not melted. I got suggestions for using jars and such but if I’m making them in the cups, freezing them in the cups would be great- if it would actually work. I have the 1500 Mega KS with all the parts. I also have had a Cuisinart Food Prep system with many blades. I had an ‘Blade Organizer’ for the Cuis. Does Ninja, or a third-party vendor, make an organizer for all the single-serves, lids, blades, bowls, etc.? I can’t seem to find one, but, could easily have missed it. I haven’t seen something like that, unfortunately! You may want to ask them directly via the chat function on their site. If nothing else, it may be a good idea for them! Can the single serve cup be used for BL 500 30 model and BL203 QWH. The single serve cups are not interchangeable between models. If there are cups that are made specifically for those models, they will work, but you can’t mix and match. I purchased the Ninja Professional 1500 watt Blender. The first time I used it trying to make Margaritas liquid leaked out along the lid and inside the handle. What do I need to do to resolve the issue of liquids leaking? The lid only goes on 1 way and appeared to be on tight. I would suggest contacting Ninja directly on this — it sounds like a defect! You have a warranty, so they should help you. Can you chop and/or make ice cream in the single serve cups? I want to get the Ninja Pulse for its size and mid range power level, but I don’t want to make ice cream in the same container I chop onions and make veggie burgers in but it has no processor bowl.. The Master Prep has a pitcher and a bowl but the top looks big and unruly, and the Mega systems seem too large and loud. Considered the 2 in 1 Flip but it looks large too, and I don’t trust that the processor bowl inside of the pitcher wouldn’t leak over the edges and dirty up both parts..Wish they hadn’t taken away the food processor with slicer/shredder from the Pulse.. thanks! will the slice and grate disc work the 1500 watt ninja’s BL685 30? can you chop a frozen burger or veggie burger? What is the limit on what is too hard to chop without damaging blades? WOuld this differ with a Master Prep vs the Pulse? I’ve had the Ninja Pro 1500 for over a year but haven’t been able to use the single serve cups anymore. Once you get them on the base…..they will not come off. Even my husband has trouble with pushing them down to twist loose. Wondering if you have heard of this problem. I stopped using the unit all together because of this. I’m going to file the tabs down a little to see if that makes a difference. I have 2 of them so can try to make one work. I can’t afford to buy another one when this one hasn’t been used that much. The big container locks on just fine, it is just the single serves I can’t use. Have you heard of this before? Just got off the phone with Ninja support, they offered to send a new motor base for just the cost of shipping, about $12. The pitcher and bowl seems to work fine and the motor sounds okay but we’re thinking if the gear thing that spins the blade assembly for the single serve cup has raised up a hair it could be making it almost impossible to remove the cup. I believe the part that is suppose to let you push down to twist it off has failed since the bowl and pitcher don’t have this problem. Pretty happy that they are willing to do this since my unit was bought in the fall of 2013. He did say he hadn’t heard of this particular problem before. I have the ninja prep pro can i use it to blend an avocado seed, whole or cut up? and which one do i use? I just purchased the Nutra Ninja Compact system 1200 with Auto IQ and was reading the instructions/warnings. It says not to process dry ingredients fand I read a review online that said it will not make nut butters unless a liquid is used). Is this correct? Are all Ninjas this way? Or is there a different version I should have bought? It says blending/food processing and total crushing on the box. I don’t want to use it if I need to return it. Thank you for this thread!!!! To be honest, I’m not familiar with that model. I’d hop on a quick chat with the folks at Ninja (they’re very helpful) and see what they say. I have found the Ninja Mega works great for making nut butters, but I’m not all that familiar with some of the newer models, sorry! My nutri ninja all of a sudden just stopped working. We tried using the regular blender and it worked but every time we tried to use the single serve to blend, the red light keeps blinking. We’ve had it for less than a year, was just wondering if there was anything we can do thanks! Hi, I left my green smoothie in my stainless steel Ninja 1100 container, drank half one day, then went to drink the other half the next evening. When I tried to open it by unscrewing it, I banged the top once firmly and completely flat against a hard surface (like you do with jars with tough-to-open lids) a couple of times. The second time did the trick, and the container exploded open with green globs all over my kitchen (and me). But the lid didn’t open – it was the bottom of the entire black 2-part lid system that came off of the stainless steel canister part! Where it came apart, I see 3-4 notches that I could align up and then try to use a rubber mallet to pound it back onto the SS canister. I am wondering if the container will then be safe to use again in the juicer? There is a removable rubber seal in place where these two parts had been attached, which makes me think it was made to possibly come off if needed. Anyone have this experience? Who knew the fruit and other ingredients would cause the drink to ferment. Or was it fermentation that caused the explosion? I’m assuming that this is why it exploded (it was only half full but was at refrigerator temperature). Yes, I ran hot water on the side of the lid also before resorting to banking the container. All parts of the container look to be in perfect shape, no damage. Can you get bigger single serve cups for the Ninja 1500? I had some gunk stuck in the lid where the little plastic piece and the spring are at. I used a screwdriver and finally popped it out so I could clean it. Now I don’t remember how to put the pieces back togehter. Could someone please post a close-up picture so I can reassemble? Susan, I came here because I had the exact same problem and found this page. A picture would be very helpful. Thanks so much! How long will the Ninja master prep blend before it burns out when blending food like coconut? I’m wondering what is the best way to make a really small amount of whipped cream with a Ninja? I’m wondering if the coffee and spice grinder would work? I’m thinking of about 1/4 c. of cream. Thanks for your help!